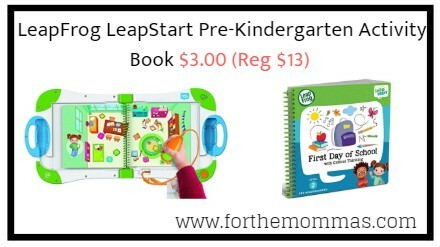 Amazon has LeapFrog LeapStart Pre-Kindergarten Activity Book for $3.00 (Reg $13) with FREE Shipping on orders over $25.00 or with Amazon Prime Orders. From problem-solving to learning to read, the LeapStart learning system gets kids excited about learning. The interactive stylus encourages proper writing grip and helps introduce school and life skills in new, exciting ways. Includes 40+ replayable activities and 25+ reward stickers. Level 2: Pre-Kindergarten. Perfect for ages 3-5.